ISSUES AROUND GAY marriage and abortion will not form part of the negotiations between the DUP and the Conservatives to support a Tory government in Westminster according to a former MLA for North Belfast. Nelson McCausland, who held the seat for the DUP, told BBC Radio 4 that the DUP is a “compassionate party” and said that any issues around abortion or gay marriage would be dealt with by the Northern Irish Assembly, and not in Westminster. Talks are set to take place between the Conservatives and the DUP in Westminster this week, as the former seeks the latter’s support to command a majority in the House of Commons. McCausland stressed that the DUP was very different from the Conservatives, and would advocate against some of the latter’s key election policies in its negotiations. “There are many things the parties have in common, but there are differences,” he said. The DUP is what I would describe as a fairly compassionate party. At this point, McCausland was interrupted and asked to clarify his statements, with the claim that “most people would call the DUP an intolerant party”. McCausland said that, in terms of austerity, the DUP is a party that “would want to avoid extremes”. “They would favour retention of the triple lock on pensions,” he said. “They favour retention of winter fuel payments as a universal benefit. They’ve expressed concerns about the dementia tax, and so on. In those ways it would not be a party that is entirely in line with the Conservatives on some issues. When pressed on whether a gay person or a woman wanting an abortion would think of the DUP as compassionate, McCausland said: “Those are matters that are devolved to the Northern Ireland Assembly. The views held by the DUP are not that different from those that would be held by some members of the Conservative Party in Westminster. He added that matters around gay marriage and abortion would not be up for discussion when the DUP sat down for talks with the Conservatives. 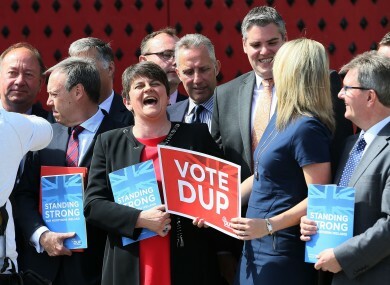 As well as its stance on issues such as gay marriage, the DUP is also under scrutiny for a €500,000 donation it received in the run-up to the Brexit referendum last year. The party has confirmed that the money was received by a pro-Union donor, but it is not known who actually gave the money. A large portion of the money – £282,000 – was spent on an advertisement in the Metro, a UK newspaper which is not circulated in Northern Ireland. The party faced criticism earlier this year for the donation, with Sinn Féin’s Máirtin Ó Muilleoir calling on the DUP to reveal the source: “Voters have a right to know from the DUP where the actual source of the donation is”. The Alliance Party of Northern Ireland, which is says voluntarily declares donations from a single source over £7,500, has called for clarity on political donations in Northern Ireland where the source does not have to be disclosed. DUP leader Arlene Foster said there had been “very good discussions” so far and she would travel to London to meet May tomorrow. Defence Secretary Michael Fallon said the government was not looking at a formal coalition but would seek assurances that the DUP would vote with May “on the big things” such as the budget, defence issues and Brexit. More than 700,000 people have signed a petition condemning the proposed alliance, saying it is a “disgusting, desperate attempt to stay in power”. Taoiseach Enda Kenny expressed Irish concerns directly to Theresa May about the impact on the Good Friday agreement of any deal with the DUP. An Irish government spokesperson said: “They discussed the outcome of the UK general election and the Prime Minister outlined the proposed supply and confidence arrangement between her party and the DUP. The Taoiseach indicated his concern that nothing should happen to put the Good Friday Agreement at risk and the challenge that this agreement will bring. He also noted the absence of any nationalist voice in Westminster following the election. Speaking to reporters today, Fine Gael leader Leo Varadkar said that the election result had significant implications.”I do have a sense that the landscape does change somewhat as a result of the British election,” Varadkar, who is expected to be voted in as prime minister on Wednesday, told reporters. I do think there is an opportunity to soften Brexit. But that all remains to be seen. Email “DUP 'a compassionate party that won't bring up abortion or gay marriage in Westminster'”. Feedback on “DUP 'a compassionate party that won't bring up abortion or gay marriage in Westminster'”.